Pergo Laminate Flooring delivers a exceptional blend of performance, design selection and innovation that no one else can match. Pergo flooring is the leader in design, new technologies and most importantly, customer satisfaction. And they sell more laminate flooring than anyone else. Pergo laminate offers so many possibilities for your home. You’re sure to find one you’ll love. Pergo Select is the ideal laminate floor for busy rooms and customers seeking design and performance in the high-traffic areas of their home. The thicker laminate surface and 10mm core board provides the highest wear, impact and indentation resistance, plus, it's protected by Lustergard Plus™, to stand up to life's daily mishaps. Pergo Select features the industry's best Lifetime Residential warranty against wear-through, fading, stains and water damage from everyday spills. Plus, it also features a 10-Year Limited Light Commercial Warranty. 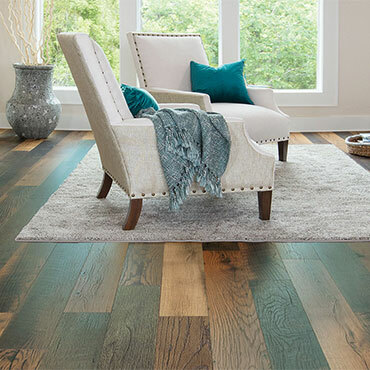 The Select plank collection features hardwood styles with the look and feel of a variety of shades and species characteristics such as: mahogany, teak, maple, walnut, cherry, pecan and pine. The Select Traditional Strip collection offers decors in your choice of 3.5" or 5" widths and micro-beveled edges for a customized and authentic hardwood look. Pergo Accolade planks are the perfect choice for the warmth and beauty of wood at an affordable price. Accolade planks offer authentic wood looks in designs ranging from rich mahogany and cherry to light and fresh oaks and maples. They also feature an 8mm high density core, All-Over Textures and their newest feature - premium attached underlayment for superior sound and noise reduction. Accolade Tiles are ideal when you want the look and feel of tile and stone designs without the worry and hassle. Every tile features their patented AccuTile Textures™ for ultra-realistic ceramic tile texture, including grout lines plus without the hassle of cracking and stained grout. Both Accolade Tiles and planks have Lustergard Plus™ surface protection and a 25-year warranty against wear-through, fading, stains and water damage from everyday spills. Quality has always been very important to us at Pergo. They strive to achieve the best quality in production and delivery as well as in design and service. Their ISO9001 certification is a confirmation of their commitment to quality. Pergo has high demands and they are very selective when choosing the materials for their floors. The material and the production are constantly monitored throughout the whole manufacturing process and regular checks are made to ensure that the quality parameters are being met. Furthermore, their lab constantly makes more advanced tests of the produced floor in order to make sure the floor live up to the standard they promise when it comes to wear-, impact-, stain resistance etc. To them quality is more than just the performance of their floor. It is also a measure of how well they can deliver the floor to you. That is why they follow up all deliveries to make sure they live up to the highest standards. Service is also an important part of a quality offer. Their presence in many European countries enables us to provide you with fast, local and direct service. Pergo was one of the first companies to meet the environmental requirements to become ISO 14001 certified. Recycling is one of the key words in their environmental policy. More than 80% of the material in their floors is from wood, but most of it is made from waste material from the lumber industry. Pergo only uses renewable wood types like spruce and pine and endangered wood is never used to make a Pergo floor. Another environmental benefit with Pergo floors is that it is totally disposable so when you burn a Pergo plank it is generating the same natural fumes as real wood. That is why they also can recycle the spill from their own cutting and milling process into energy. The work environment in their factory is something they are also very proud of. It’s very clean and worker friendly, and it has been built to minimize any potential negative impact it may have on the surrounding environment. They also place high demands on themselves when it comes to environmental health in the home once the floor is installed. That is why all their floors are allergy friendly, resistant to static electricity and have natural anti-bacterial properties. RALEIGH, N.C.—Despite more than three years of negative sales for the laminate category, brand leader Pergo has not let up on the innovation button. Last year the company introduced the patented PerfectFold locking technology (FCNews, Sept. 28/Oct. 5, 2009) and, as it prepares for next year’s introductions, a new printing innovation has been announced.